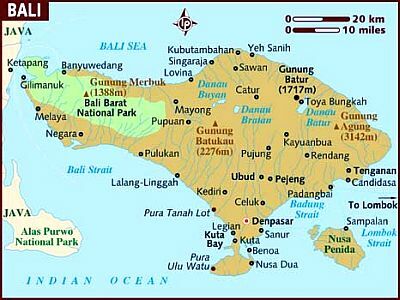 Bali is an Indonesian island, located just a few degrees south of the equator. It has a tropical climate, hot all year round, with a rainy season from November to March, and a relatively dry season from April to October, when, however, some showers can still occur. In the rainy season, it usually rains a couple of hours in the morning and a couple of hours in the afternoon, while in the rest of the day the sun shines for a few hours. Temperatures are high and uniform throughout the year. They are slightly higher from October to March, when the daily average is around 27 °C (81 °F), and a bit lower from June to September, when the daily average is around 26 °C (79 °F). In the rainy season, there's muggy heat due to high humidity. Here are the average temperatures at the airport, located near the capital, Denpasar. Throughout the year, 1,700 millimeters (67 inches) of rain fall, with a maximum from December to February, when the rainfall ranges from 280 to 350 mm (11 to 13.5 in) per month. In the dry period, from April to October, the rainfall is below 100 mm (4 in) per month, with a minimum in August of just 15 mm (0.6 in). The rainfall amount, however, can change from one year to another, so if we analyze the rainfall records, we can see that sometimes the rainy season can last until April, or begin as early as in October. Here is the average precipitation in Denpasar. In the interior of the island, occupied by hills and mountains, the weather is more likely to be cloudy and rainy. The highest peak is Agung volcano, 3,000 meters (9,800 feet) high. Being closer to the inland elevations, the northern coast is rainier than the southern one. The southern part of the island, where Denpasar is located, in addition to cities such as Kuta, Seminyak and Pecatu, is therefore the least rainy. If you are planning some hiking at high altitudes, keep in mind that above 1,000 meters (3,300 feet), in towns such as Bedugul and Kintamani, it's cool in the evening and at night, especially in the dry season, while above 2,000 meters (6,500 feet) it can get quite cold. In addition, at noon and in the afternoon the chance of thunderstorms in the highlands is higher than on the southern side, where the majority of the resorts are found. In Bali, there's plenty of sunshine in the dry season, while in the rainy season the sun shines for a few hours a day, between one rain shower and another. In the interior of the island, a blanket of clouds often lies over the mountain peaks. From November to mid-May, but more often from January to mid-April, Bali can be brushed by tropical cyclones, which usually do not hit it directly, but pass over the ocean not far to the south, bringing an increase in wind and rainfall. 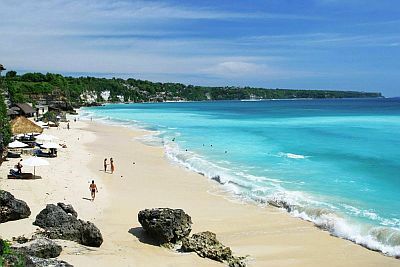 The sea in Bali is warm enough to swim in throughout the year: the water temperature ranges from 27 °C (81 °F) between July and September, to 29 °C (84 °F) between November and May. The western part of the Bukit peninsula, where waves are higher, is preferable for surfing. The best time to travel to Bali and enjoy its beaches is from June to September, the weather is usually sunny, the heat is not too intense, and in any case, it's tempered by the breeze. There are just some brief downpours or thunderstorms every now and then, which, however, are more likely at night and in the early morning. August is the best month, since it is the driest. May and October, too, are months you may want to consider, in fact they are the best ones among those that do not fall in the high season: they are a bit more muggy and rainy, but they are still out of the actual rainy season. However, in inland and mountainous areas, thunderstorms are frequent. Being that Bali's climate is hot all year round, you can bring light clothes of natural fibers, a sun hat, a scarf for the breeze, and a light sweatshirt for the evening. From November to March, you can add a light raincoat or an umbrella.